Lacrosse, which draws its history from Native American culture, is one of America’s oldest and fastest-growing sports today. Played by both girls and boys of all ages, it’s a fast-paced game that combines quickness with delicate coordination. With the inclusion of metal sticks, a dense ball, and contact, injuries in lacrosse are more diverse than other sport. 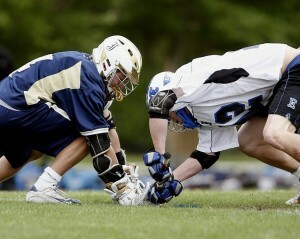 The risk of injury differs in boy’s and girl’s lacrosse, however. While both games have the same objective, there are some minor differences in the rules and equipment. The biggest difference is that boy’s lacrosse allows physical contact between players, while girl’s lacrosse is considered a non-contact sport. Surprisingly, non-contact injuries are some of the most common to occur in the game. Knee and ankle sprains, muscle strains, and shin splints can all be sustained while making quick cuts on the field or running for prolonged periods of time. It’s important to stretch before every practice and game to avoid this degree of injury and ready your muscles for physical activity. If you feel exhausted, or something doesn’t feel right, tell your coach and take a break from play. Concussions are also fairly common in lacrosse. A concussion is a type of traumatic brain injury caused by a blow to the head or a violent fall. The use of sticks and a hard ball increases the risk of concussion in both boy’s and girl’s lacrosse. Boy’s lacrosse, which allows physical contact, increases the risk of a blow to the head or hard fall. If you get hit in the head or fall, you should stop play and tell your coach immediately. Some of the most common symptoms are dizziness, not being able to think clearly, and sudden nausea. Report any symptoms to the medical trainer and don’t attempt to return to the field until you’re cleared to play. Unfortunately, not all injuries can be avoided. If you have a sports injury and need physical therapy for rehabilitation, Physical Therapist Finder allows you to find the perfect doctor. Office hours, ratings, services offered, and insurance are all available so you can make the best choice of doctor to get you back out on the field as quickly as possible.